Chronicle is our vision for how devices, data and decisions can come together in a real time, context-rich solution. According to the Centers for Disease Control and Prevention, chronic conditions that can be controlled but not cured, like cancer, heart disease, and diabetes, are the leading cause of death and disability in the United States, accounting for 70% of all deaths. Treating people with chronic conditions accounts for 86% of the costs in our nation’s healthcare system. But while the macro numbers are staggering, the real-world challenges to an individual who lives with one or multiple chronic conditions are even more impactful. From daily management of symptoms and medications to constant worry about how new situations and environments might trigger a crisis, if you are one of the 50% of US adults who live with a chronic condition, your quality of life is constantly under threat. So we asked ourselves – if more than 90 million healthcare and fitness devices shipped in 2015 alone, if people themselves embrace managing their wellbeing through the 165,000 health apps available today, and if patients are willing to share their data to improve health outcomes for themselves and others, shouldn’t there be a way for people with chronic conditions to see and use the experiences of others to create more positive outcomes for their health? This is the premise of Chronicle, our concept for a cloud-based platform and smartphone app that integrates real-time environmental, device, biometric, and self-reported data from people with shared health factors. 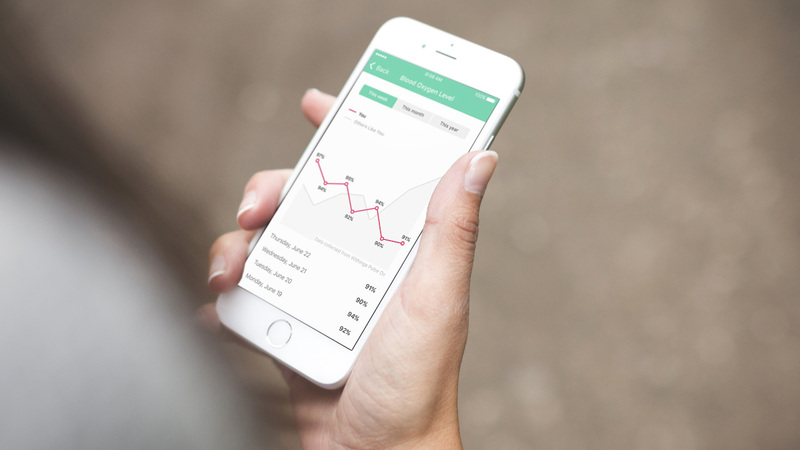 Chronicle helps people quickly gain meaningful insights and make more effective decisions regarding their chronic conditions using real-time, shared data. If you don’t live with a chronic condition, choices like which route to take as you walk to work, are often simple and unconscious ones. But for someone with chronic obstructive pulmonary disease (COPD), for example, it can be a critical decision that may end up costing her physical pain, time in the hospital, and unexpected medical bills. If they take a more scenic, but longer, more strenuous route, without taking into consideration their current state or environmental factors, they risk a significant health setback. These are the people Chronicle is designed to help. 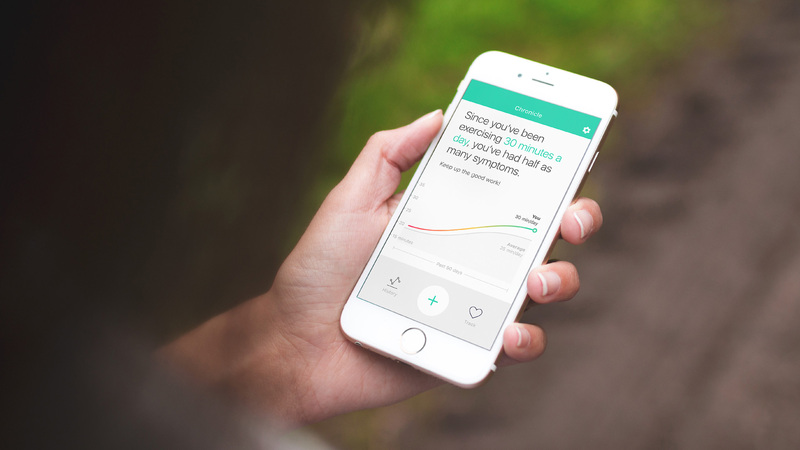 The app prompts users to develop a personalized profile based on their conditions and symptoms as well as device and sensor availability. 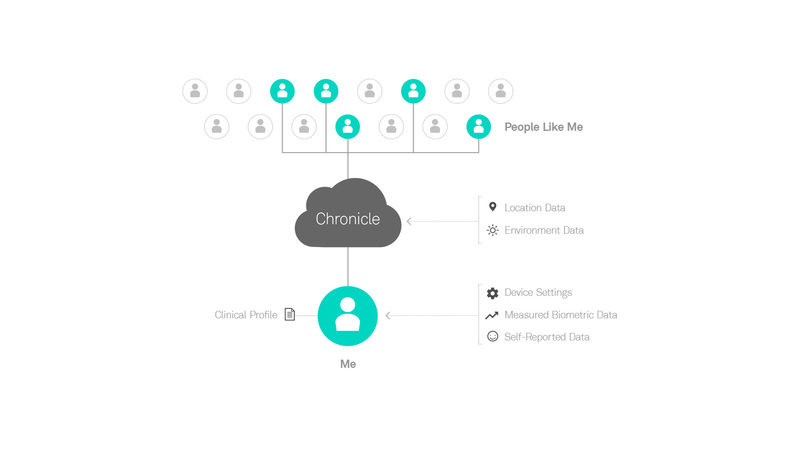 Chronicle analyzes and matches one patient profile and layered, real-time contextual factors, to that of others with similar attributes and in similar contexts. 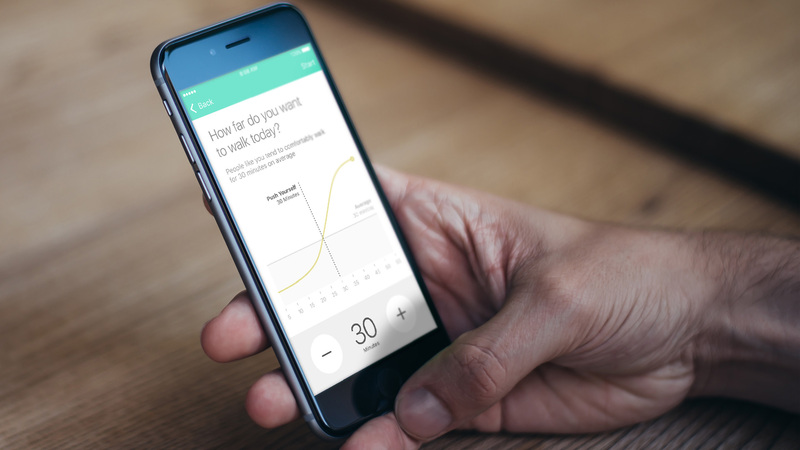 It then surfaces insights and alerts that help the person make smarter choices about everyday life. 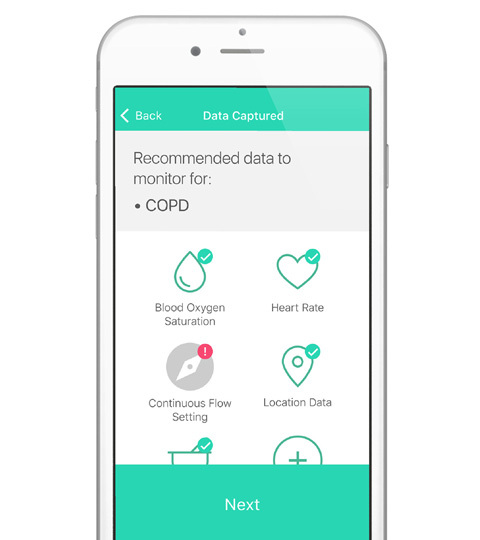 In the case of our COPD scenario, Chronicle can alert the patient that in similar situations, people with similar clinical profile, symptoms, and biometric measurements were able to safely complete a strenuous walk. While the symptoms of chronic conditions vary, people seek to understand what their symptoms mean, want to discover what impacts how they feel, and need to know how their actions may make their daily lives better. The Chronicle core experience is designed with each of these goals in mind. 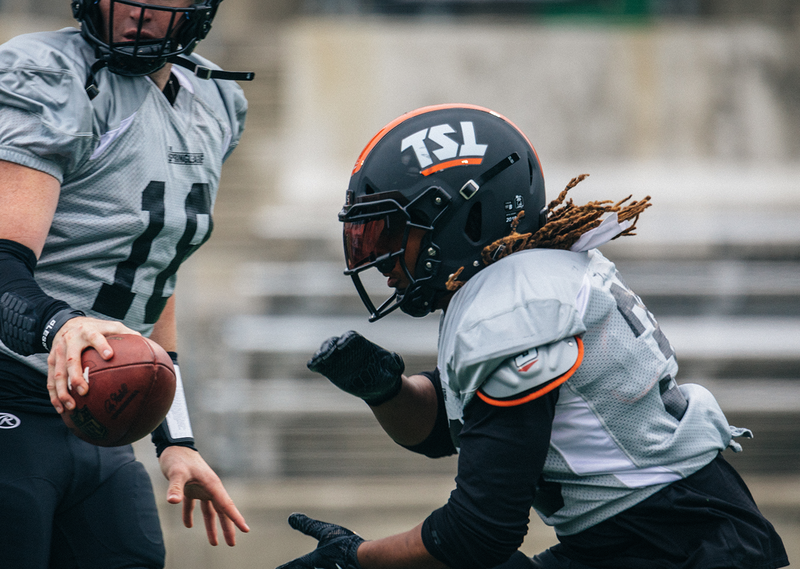 Insights, considerations, and the ability to explore personal historic trends give people deeper understanding of how their symptoms change in different circumstances. A special high-sampling tracking mode can be activated when a patient decides she needs extra monitoring or guidance, for example when she decides to try a new activity. Proactive alerts and cross-device notifications keep her up to date on what she should know even when she is not focusing on the app. Unlike single-focus solutions, Chronicle allows patients to explore multiple conditions at once. This is especially important as chronic conditions often lead to other complications and comorbidities. As more and more consumer and medical devices come online, they generate valuable data that can help create a detailed picture of one’s health. We envision Chronicle as an open platform that integrates data from many sources and creates a multidimensional understanding of chronic conditions. 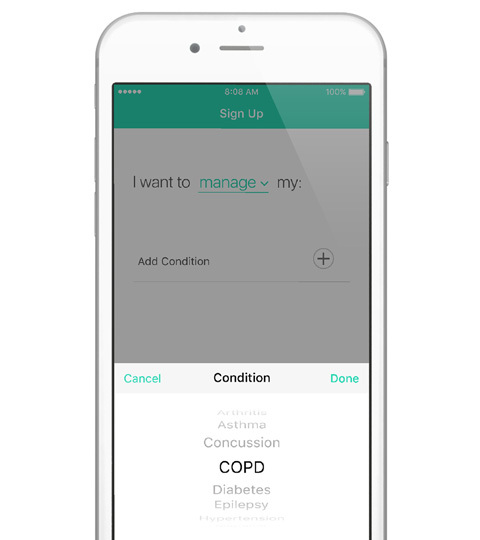 Chronicle is designed to support the emotional needs of people with chronic conditions. We designed the exeprience to feel more like communicating with a friend or a guardian and less like a medical device or doctor’s visit. As we move to a world where patients are becoming more engaged and making more decisions about their care, it is important to empower them with control over the data they track. 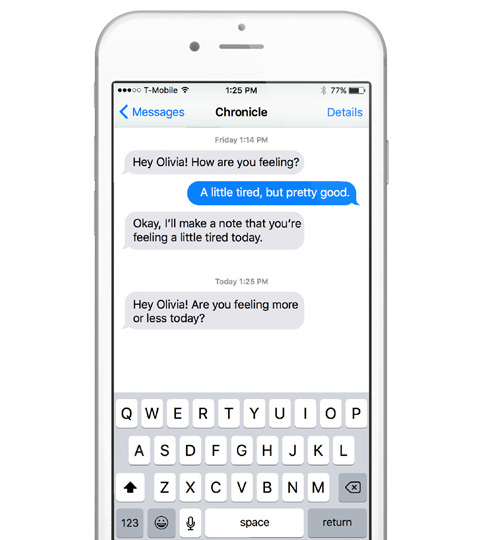 Unlike other health apps, which make assumptions about why the user has engaged with the app (and predisposes them to a certain experience tone and workflow), Chronicle allows patients to define the experience which will be most meaningful to them. Chronicle supports this need with an easily glanceable sensor screen and the ability to quickly turn sensors on / off for different views on how they are doing and how they can learn from the data of others like them. The system can learn how people prioritize symptom input and what insight cards are most useful, and then the system can make recommendations to other users on how their experience is best structured.